I’ve converted this post that I published on March 2 into a sticky. May 2012 is the month for the annual Baillie Birdathon, which is hosted by Bird Studies Canada and is the oldest sponsored bird count in North America. This will be my first Baillie Birdathon and I hope to see at least 85 species, 90 if I’m lucky. I will be a team of one and hope to make the best of the 24 hours. I’m not sure what day I will be counting yet, but as we get closer to May I’ll have a better idea. Since I am a team of one, my goal is to raise $250, and I would like half of the money I raise to go to the Long Point Bird Observatory in Ontario, which does very important work in Canada. If you would like to sponsor me, you can visit my team page. 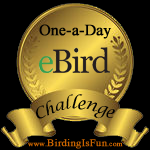 I would be very happy to reach my goal for my first Baillie Birdathon. UPDATE: As of April 9th, I reached my goal and in fact am over it at $265. Thank you so much to all of my sponsors. But donations will continue to be accepted. Since I’ve never done a Birdathon before and will be doing it by myself, I was afraid about picking the suggested amount for my goal ($500). So I picked a low number, and am delighted that I met my goal. I would still like to try for $500, with no pressure now! Thanks again to everyone who has supported me, and anyone else who would like to consider it. This entry was posted in Alberta Birds, Birding Events, General Birding, Great Canadian Birdathon, Spring, Year List and tagged Bird Studies Canada, Great Canadian Birdathon, Long Point Bird Observatory. Bookmark the permalink. Thank you very much for the donation David, I really appreciate the support!